There was no church scene. There were no tambourines or drums, no preachers loudly proclaiming Leviticus 20:13, Romans 1 and 1 Corinthians 6:9. There were no flamboyant choir directors, teenagers named Arthur or bluesmen named Jimmy; no John or Gabriel Grimes; no Elishas. Yet, this film, Moonlight, directed by Barry Jenkins, could’ve been James Baldwin’s, could’ve been his fictional narrative. And this is because Moonlight, like Baldwin’s work, is all about feeling. And in that way, like Baldwin’s work, it’s also, then, about blackness, religion and the failure to find sanctuary in the most ordinary, everyday, supposedly safe spaces. I don’t even remember his name. I sorta remember his picture from AOL—a chat room, but which one, I don’t remember, either—but I remember how I felt. I was experimenting, a high school senior with a college sophomore. I remember I didn’t like him much, that who he was, what he said in his profile and his picture didn’t match the person who showed up at my door later. But I wanted to try because I’d felt so alone that I let him in anyway. I remember thinking that I’d go to hell as soon as he left my parents’ house. It was around 3:50 p.m. and I walked him to my bedroom, up the creaky stairs that made too much noise. I had an hour and maybe 10 minutes. He’d have to get in and get out before my parents got home. His breath stank. His Afro was asymmetrical. We barely did anything at all. I have not seen him since that first and, thus, last day. I let dude in my house because I wanted to be touched and wanted to feel wanted. I let him in my house because I was seeking connection. I’m thinking about this, and so many other random encounters, because what Moonlight highlights so well is a kind of loneliness and desire that can lead to all kinds of random encounters. Random encounters that are grounded in touch. Random encounters of intense feeling include Juan (played by Mahershala Ali) reaching out and extending care to a little boy he didn’t know but felt a kinship with, an affinity to. He touched Little (Alex Hibbert), held him gently in water, baptized him to life as possible. Random encounters of intense feeling include Paula (Naomie Harris) and her addiction to crack, how she went from moods of intense love to explicit and harsh rejection of her son. She was touched, too, by Black (Trevante Rhodes) as tears streamed down her face. Everything in the film, this masterpiece, was a reach for connection. Little, then Chiron (Ashton Sanders), then Black, at each stage of Moonlight, felt the touch of Kevin. In such touch was sanctuary and refuge, in such touch was gentleness and quiet. A kind of quiet that was softly vibrational. For Black, in Act 3 of Moonlight, it is revealed that he’d not been touched since Kevin in high school. Was it just the teenage experimentation on the beach, head held in hand, hand gripping sand, he meant? Or did he also mean the violent touch on high school property, the confrontation with Kevin? The intimacy, discomfort, touch and feeling produced a confrontation with viewers. Would you dismiss it as a gay tale that is sinful because of what the Bible says? Would you discredit it as lacking a plot altogether because a bildungsroman of a black boy is much too much askance for you to consider it real? Or is watching the intimacy between men the occasion for memory and remembrance? The film compels visceral response to it by capturing the visceral quality of Chiron’s lives. It’s about discomfort that emerges in dreams that allow you to consider that other ways of existence might not only be possible, but also pleasurable; that they might bring joy against sorrow, joy unspeakable. Such unspeakable joy becomes imaginable through the discomfort of watching Little, then Chiron, then Black, with Kevin. It’s about intimacy, touch, feeling. It’s about the search for something so wildly and radically free that he would wait to be touched like that again. The film also confronts viewers with a fundamental truth: Homophobia in black is not worse than its performance in other shades. The film does not allow audiences to decry the nature of blackness as the zone in which homophobia is produced. There was Juan. There was Teresa (Janelle Monáe). There were the three Kevins. Each provided a space of reprieve and sanctuary; each provided refuge without judgment, without shaming. What’s that song that, when you hear it, makes you remember? That smell wafting from the kitchen that reminds you of Mama’s cooking? That color seen that dredges up what happened that day in school so many moons ago? Kevin hears a song and it forces him to recall Chiron. The sound of the song is memory for him and produces the occasion to reach out, to call, to seek reconnection, to seek touch. 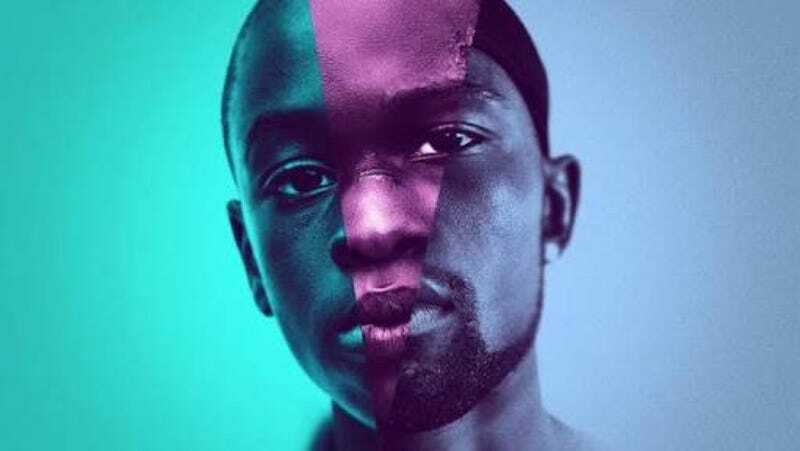 Moonlight is a sensual film because it uses various sense experiences—taste, touch, smell, sight, hearing—to be not just the path toward memory, but memory itself. In being about sense experiences, it is about how one feels—and black religiosity, its history and tradition in the so-called new world, is all about feeling. At its best, when not colluding with white supremacist capitalist patriarchy, black religiosity allows us to learn how to love our flesh, and love it hard, in a world that does not deem blackness as loving or lovable. The characters typically would be considered sinners according to a lot of religious logics. So we have to think about the way religion is unmarked in Moonlight in ways that create the opportunity to critique the way spaces of so-called sanctuary can become spaces of violence. This is the genius of Moonlight. The film wages battle at the level of feeling. Such feeling is often the taboo of dreams or sometimes nightmares, never to be spoken aloud, never to be admitted. You dreamed of her but are not into women. You think of him, how he sometimes hugs you on the court quickly, but in that minuscule moment your heart heats, chest heaves, but he’s just a basketball buddy. It’s the feeling that emerges in night terrors that makes you smile and open your heart to capaciousness, to expansiveness, to possibility. At its best, when not colluding with white supremacist capitalist patriarchy, black religiosity allows us to learn how to love our flesh, and love it hard, in a world that does not deem blackness as loving or lovable. The film gathers and depicts the quiet brush of soft intimacy between friends. It is an intimacy learned and produced by gesture, by deep looks, sustained grasped hands. Grabbed sand, chopped onions, slow stares, held head. But then, I guess it’s also about fear, about the fear that such a connection—once established—cannot be sustained. So, for many of us, we just reject the possibility altogether, reject the possibility as desirous, dismiss the possibility as ridiculous. But if we remain with the film, if we open ourselves up to its visceral nature, its touch and rub, its hush and hum, it has the capacity to transform what we think imaginable. And it produces the excitement of imagination through the most ordinary and everyday of encounters, the most simple and gentle ways of existence. Thankfully, winner of the Oscar awards for best picture, writing of an adapted screenplay and best supporting actor, the film yet exceeds easy categorization and framework. Moonlight is not a frivolous film. It is a film of its time, rooted in the 305, in the blackness of the Liberty Square housing project, in the complexity of character and life and love in Miami, in the freedom dreams that emerge from within the struggle with living, with touch, with desire. Moonlight is a touching film, illustrating the healing and generative force of touch between characters. And in such exchange between characters is the capacity for healing and a generative force for viewers. This is the genius of Moonlight. The film wages battle at the level of feeling. Moonlight reminds me that black life is about a life touched and held, and that there is joy therein, that the touch I have sought and still seek is one that many of us desire, and that such desire is worthy of its pursuit. And Moonlight reminds me that we should seek out and find delight in black life, and that this joy and delight can be found in the general spaces, the regular places. That we can desire and find touch that frees; touch that makes us remember and makes us forget; touch that holds us close until we lovingly and intentionally embrace those parts of ourselves that we dared not speak into existence. Ashon Crawley is assistant professor of ethnic studies at the University of California, Riverside. His first book project, Blackpentecostal Breath: The Aesthetics of Possibility (Fordham University Press),​ is an ​investigation of aesthetics and performance as modes of collective, social imaginings otherwise. Follow him on Twitter.